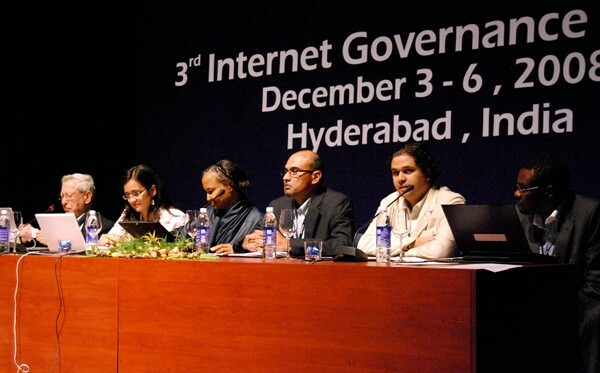 The NRO was represented at the third meeting of the Internet Governance Forum (IGF) in Hyderabad, India, from 3-6 December 2008. Adiel Akplogan, CEO of AFRINIC, and Raúl Echeberría, Executive Director of LACNIC, were members of the Multistakeholder Advisory Group (MAG) that helped to plan and coordinate the IGF. Adiel Akplogan (AFRINIC) spoke at the main session on Transition from IPv4 to IPv6, while Raúl Echeberría (LACNIC) spoke at Global, Regional and National Arrangements. Organised by AFRINIC and ARIN, with a speaker from APNIC, this workshop introduced key infrastructure concepts to the IGF participants from non-technical backgrounds. Paul Wilson (APNIC), Chair of the NRO, joined panelists on the workshop. Organised by APNIC in partnership with other organizations, this workshop discussed practical ways Internet operators can provide Internet connectivity in challenging circumstances. German Valdez (APNIC) spoke at the official closing session of the IGF. NRO Press Release "IPv6 Growth Increases 300% in Two Years"